The Focused Approach to Safety provides additional resources to eligible high priority States to address the Nation’s most critical safety challenges through additional program benefits such as people, time, tools and training. This approach increases awareness on critical severe crash types, leads to key safety infrastructure improvements, assists in prioritizing limited resources, and creates positive organizational changes in safety culture, policies and procedures. Each eligible State participating in the Focused Approach will be assisted in addressing fatality reductions in any one or all of three critical focus areas. These areas have been identified as providing the greatest potential to reduce highway fatalities using infrastructure-oriented improvements, namely: roadway departure, intersection crashes, and pedestrian/bicycle crashes. These three focus areas encompass almost 90% of the traffic fatalities in the U.S. The Focused Approach to Safety is a data-driven process. 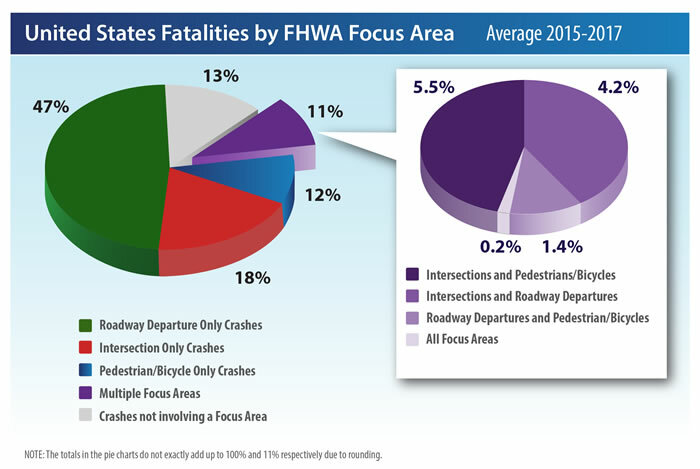 In 2014, FHWA updated the data definitions used to determine the number of crashes associated with each of the three critical focus areas. A memorandum explains the historic and current data definitions and provides a listing of fatalities in each State using the definitions for each focus area. Additional detail is included in this Technical Brief. For data analysts, the SAS codes are also provided. This coding was specifically developed for the changes in the Fatal Analysis Reporting System (FARS) that occurred in 2010. In 2015, FHWA evaluated the Focused Approach to Safety process. The major change made as a result of this evaluation is to the Focus States for the Intersection and Roadway Departure focus areas, based on new data and new criteria. There were also some minor adjustments to the Pedestrian/Bicyclist criteria and in combination with the new data there were some changes in Focus Cities and Focus States within this focus area. Other changes to the process include further tailoring of available technical services and refinements to the monitoring process. The revisions are described in a July 29, 2015 memorandum. What are the benefits of being a Focus State or Focus City? Eligible focus States participating in the Focused Approach will have priority access to assistance. They can receive technical assistance such as data analysis and action plan development from initiation to implementation; training and associated materials in a variety of formats, including classroom-based workshops or online webinars; support for a wide range of analysis tools and countermeasures. What has changed regarding the Focused Approach to Safety? Bicyclists were added to the Pedestrian Safety focus area. 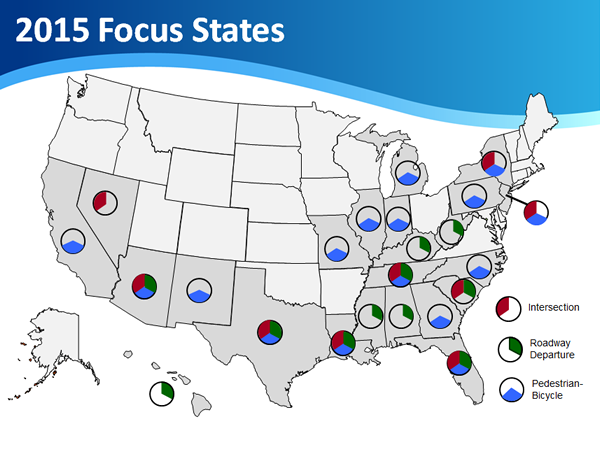 Updated data definitions for each of the focus areas were used in selection of Focus States and Focus Cities. These data definitions are discussed in a July 29, 2014 memorandum. Averages of 2011-2013 fatalities were used in the analysis. Intersection and Roadway Departure criteria were changed to eliminate the bias to large states and instead compare actual to expected crashes for vehicle miles of travel (VMT), population, and center line miles. Pedestrian/Bicycle criteria used the 20 cities with the highest number of fatalities, rather than those with number of fatalities above the average for the top 50 cities. A more tailored approach, which may include a self-assessment, will be used to determine the technical assistance that will be provided to each Focus State or Focus City. The evaluation of the Focused Approach to Safety will allow for a number of potential measures of effectiveness. Why is my state a Focus State? The criteria and methodology for determining focus State eligibility were revised in 2015. The Intersections and Roadway Departure focus areas use similar analyses to determine State eligibility. The Pedestrian/Bicyclist focus considers data at the city level, because these crash types are predominant in urban areas, and any State with a Focus City is designated a Focus State. In general, eligibility is based on States and cities with the greatest potential for safety improvement. Detailed explanations of the criteria are shown below. All eligibility criteria use a three-year average of the most recent available national fatality data (2011-2013). Intersection and Roadway Departure Focus States: FHWA considers the percentage of urban and rural VMT, population, and center line miles of roadway within each state and calculates an expected intersection fatality rate and an expected roadway departure fatality rate for each of these three measures of exposure by comparing it to the national percentages and fatality rates. (Note: for intersections, freeway VMT and centerline miles are excluded). The ratio of each State's actual fatality rate to the expected fatality rate in each of the three measures (VMT, population, and center line miles) is then calculated. States are designated Intersection or Roadway Departure Focus States if they have a ratio higher than 1.0 for all three measures of exposure (e.g. Intersection Focus States have an actual intersection fatality rate higher than the expected fatality rate based on VMT, population, and center line miles of roadway). Pedestrian/Bicycle Focus Cities and States: FHWA considers the 50 cities with the largest number of pedestrian/bicycle-involved fatalities (those with an annual average of approximately 10 or more fatalities). Cities are designated a Pedestrian/Bicycle Focus City if they are among the top 20 cities for number of fatalities or if the fatality rate per population is greater than the average of the top 50 cities. States that contain a Pedestrian/Bicycle Focus City are designated Pedestrian/Bicycle Focus States. If our state is a new Focus State, new to a particular focus area, or has new Focus Cities, what does it mean for our safety program? Welcome to the Focused Approach to Safety. There will be additional resources and options available to assist your State as you participate in the Focused Approach. The first step will to be to create a tailored approach to find the right mix of resources (people, time, and training) to maximize the benefits to assist you and achieve the best fatality and serious injury reductions. The FHWA Office of Safety program lead for the focus area and the safety specialist in your local FHWA Division Office will work directly with you and your partners. FHWA Resource Center staff and contract support will be brought into the process as needed. Working together will result in additional lives saved and injuries prevented. You also become eligible to submit projects for Accelerating Safety Activities Program (ASAP) funding in coordination with your LTAP/TTAP Center. If our state is no longer a Focus State in one or more focus areas, or some of our cities are no long Focus Cities, what does it mean for our safety program? First, on-going efforts under the Focused Approach will continue and be concluded in the summer of 2016. We will continue to provide priority status to these agencies over this one year transition period. Second, FHWA support will still be provided as it is to other non-Focus States, it will simply not have as high of a priority as the needs of Focus States and Focus Cities. Finally, as a prior focus State, FHWA wants to hear and share your valuable feedback, lessons learned, or success stories that can assist other Focus States as they participate in the Focused Approach to Safety. Be sure to stay in touch with the safety specialist in your local FHWA Division Office and FHWA Office of Safety program lead to provide any feedback you may have regarding the Focused Approach to Safety. If I am not eligible as a Focus State or Focus City, can I still access the technical assistance and guidance? All of the guidance, planning tools, training, technical guidebooks, and printed resources created by the Office of Safety are available to all States. FHWA is committed to a concerted effort in applying these resources and tools in the Focus States. These Focus States and Focus Cities will receive priority in response to requests for safety resources to address their safety challenges in one or more of the focus areas.